SQL injection: still one of the more common exploits against web applications, and yet it is one of the easier ones to guard against. Unfortunately, bad tutorials often teach newbie developers bad habits that enable injection attacks, rather than using more secure methods of interacting with databases. Wouldn’t it be useful if there was one resource you could point people to in order to explain SQL injection and show some examples of best practices in their language of choice? Having trouble importing a large SQL dump through phpMyAdmin? This is a problem that often plagues users of shared web hosting, when they’re moving to a new host or restoring a backup. Since most shared hosting providers don’t offer shell access, you have to use a tool like phpMyAdmin to upload and load your SQL file. Unfortunately, phpMyAdmin often has trouble processing large files. Sometimes it takes so long for the process to run that it times out, or other times the upload quota is simply too low. The split command takes a file and breaks it into multiple files. The -l 5000 part tells it to split the file every five thousand lines. (You can tweak this value to find a good medium between fewer files and larger sizes.) The next bit is the path to your file, and the next part is the path you want to save the output to. Files will be saved as whatever filename you specify (e.g. “dbpart-“) with an alphabetical letter combination appended. Now you should be able to import your files one at a time through phpMyAdmin without issue. You may have heard that the old MySQL extension for PHP is going to eventually be deprecated in favor of the newer (and potentially more secure) MySQLi and PDO extensions. You’re going to need to update your old code sooner or later, so why not make it sooner? I’m going to recommend PDO over MySQLi simply because it’s available on more systems, and it’s syntax may be a little bit easier to learn for newbies. PDO has been bundled with the main PHP distribution since PHP 5.1, and has been in PECL even longer, while MySQLi has only been included since 5.3. Whichever you use is up to personal preference and project requirements of course, but I will be sticking with PDO for the duration of this tutorial. I just read one of the most interesting articles Net.Tuts+ has published in the last few months: An API for the Web: Learning YQL. Web apps and web services multiply like rabbits. They’re all fun to play with (like rabbits) and fun to integrate into other projects (unlike rabbits). But learning a new API every other day isn’t feasible or fun. And that’s the problem the Yahoo Query Language (YQL) is out to solve. Think of YQL as the API for the web, the one API to rule them all. It’s not a hard one to learn, so let’s get you up to speed right now! I couldn’t have said it better myself. YQL is just that: a wrapper for other APIs. It makes it easy to gather data from virtually any API, mash data up if necessary, and bring it into your own application. With generous daily query limits, and no commercial usage restrictions, what’s not to like? Very much like an SQL query, no? And there are “tables” to obtain data from many sources, such as Delicious, Netflix, Facebook, Flickr, Github, Last.fm, RSS feeds, etc.. Is there not a table for an API you need to use? You can create one. Result sets can be returned as XML or JSON. Developer tools like this and the BOSS search API, which is one of the available tables in YQL, are what I believe will keep Yahoo alive in the coming years. Digging into WordPress has recently published a new article on securing WordPress. It covers setting up optimal database privileges, adjustments you can make to your wp-config.php file, changing the table prefix, changing the default admin username, and a couple other things. Of course, when it comes to the security of your WordPress site, these techniques are merely the beginning. As you continue in your WordPress travels, you will discover many, many more ways to increase the security of your site. By implementing the methods presented in this article during the setup process, you will be strengthening the security of your site’s foundation, providing yourself a solid platform on which to build. Definitely worth a read if you haven’t already looked into the techniques. You may already be familliar with the problem of MySQL Injection, a common exploit that can cause irreparible damage to a database. You may not be aware of it, but there is an alternative to the “mysql_*” function set. The mysqli functions, for “MySQL Improved” are used in much the same way as their predecessor, but they have some advantages. One such advantage is “Prepared Statements,” a method of preparing a query that separates the data from the syntax. Prepared Statements are a little harder to use, but they are more secure, and arguably easier to write and maintain. Instead of grabbing and building the query string using things like $_GET[‘username’], we have ?’s instead. These ?’s separate the SQL logic from the data. The ?’s are place holders until the next line where we bind our parameters to be the username and password. The rest of the code is pretty much just calling methods which you can read about by following some of the links at the end of the article. SQL Injection is one of the most common exploits. It’s a sneaky technique that takes advantage of unsafe database querying practices to gain access to the database. Smashing Magazine has done it again. Their latest post, 8 Useful WordPress SQL Hacks, is a goldmine of useful tricks to streamline your WordPress experience. Definitely some knowledge to have your blogger’s toolbox. If you really want to master SQL, I’d recommend reading Learning MySQL or similar book. Almost anyone who’s played around with PHP before has run into the subject of databases. MySQL databases are the most common method of storing massive amounts of data to later be sorted through and retrieved for display via script. WordPress stores all of it’s posts and settings in MySQL tables, forum scripts are powered by databases, sites like Amazon, YouTube, and of course IMDB make extensive use of databases. If you think about it, most modern websites are just pretty user interfaces for databases. As common as they may be, databases sure are mysterious critters. It look me awhile to grasp the concept of them at first, and even longer for me to pick-up the skills required to make use of them. In addition to knowing a scripting language like PHP or Perl, and how to submit a query to the DB server, you also need to know the SQL language. 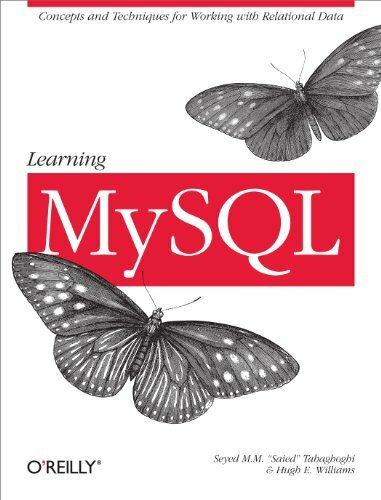 I just finished a great book on MySQL. Learning MySQL by Seyed M.M. Tahaghoghi and Hugh Williams is a comprehensive and well-explained book that teaches you from the ground up about MySQL databases and how to work with them. It introduces the concept of a database, walks you through installing the MySQL server software (if you’re not already running it), explains querying, then moves on to the real meat of the book: Structured Query Language, or SQL. It covers basic SELECTS and INSERTs, JOINS, nested queries, table and column types, and really everything you need to know to get started. Following chapters cover topics like using PHP or Perl to interact with databases (as opposed to using a MySQL prompt) and securing web applications. There are also sections on planning database structures optimally, optimizing performance. The book is written in a manner that should make it easy to follow, it’s full of code examples to try out, and overall is enough to give you a general to intermediate knowledge of MySQL. It also works as a handy reference.